What Should Morphology Instruction Look Like? Are there any resources that provide a list of morphemes to teach at each K-5 grade level? I have been looking for a definitive list of morphemes that is organized by grade level like the Fry sight word list. I often come across research about how L1 and L2 students acquire morphemes, but I am looking for a list that represents the morphemes that students will most likely see in print at each K-5 grade level. Does anything like that exist? Thank you for your time. But when have I ever been satisfied with the short answer to anything? Let’s make sure we’re all in agreement as to what constitutes a morpheme? Basically, a morpheme is the “smallest grammatical unit.” It isn’t the same thing as a word, and yet many words are morphemes. The distinction turns on whether the unit (the morpheme or word) can stand on its own. Words have to have that kind of independence, while morphemes don’t require it. Thus, bags, trucked, running, and redirect are all words in the English language while bag, s, truck, ed, run, ing, re, and direct are all morphemes. Each morphemic unit carries meaning, but sometimes morphemes can do that independently (bag, truck, run, direct), and sometimes they need to be combined with other morphemes to be considered a word (s, ed, ing, re). “I have no knowledge of such a list, but I wouldn’t recommend one anyway. “My recommendation based on theory not direct research evidence — is that the main value comes from teaching all or many members of a morphological family at one time with the matrix and word sums (see the attached figure illustrating a matrix and word sum). In the younger grades I start with free bases [those morphemes that stand alone as words], but once that is established, I have no trouble introducing bound bases [the units that can’t stand alone]. This relates to the research we cite about the value of studying meaningfully related items at one time rather than disconnected items. “Instead of a “scope and sequence” of morphemes to teach, what I recommend is starting with words in the children’s vocabulary, analyzing such words to find their bases, then looking for other members of that family. “The point is not that there is a “scope and sequence” of morphemes to teach. Rather there is a kind of a “scope” of orthographic concepts that we want students to learn, and teachers can address those concepts based on whatever words are central to the readings they are introducing to the students. 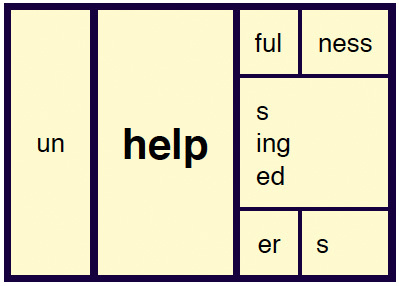 Bases and affixes (morphemes) are the meaningful building blocks that construct words. We can analyze complex words into constituent morphemes with word sums and show their interrelationship with a matrix. Thus, we need to understand grapheme-phoneme correspondences from within the context of morphological families. (e.g. we learn the phonology of the grapheme by studying morphological families). There are reliable conventions for the three suffixing conventions. Studying and understanding the suffixing conventions is not primarily about improving spelling accuracy, it is about being able to analyze hypotheses about connections between words. We can test the hypothesis that "imagine" has a base "image" only if we know vowel suffixes replace final, non-syllabic "e" (image/ + ine —> imagine). The “structure and meaning test”: To determine that two words share a base, we need evidence from both structure (word sum) and meaning (etymology). So with the earlier example of words related to "play" (play, playing, playful, replay, playhouse), we can prove all of those words can be analyzed with word sums with coherent affixes and bases. But we can also show that they all go back to an Old English root plegan, plegian for “frolic, move rapidly”. However, the word "display" which can be analyzed structurally turns out not to be related. It does not belong in the morphological family with the others because it goes back to a Latin root plic(ere) for “fold”. So to “display” is to “unfold”. “If we are going to teach children how their writing system works, we need to teach them the interrelation of morphology, phonology, and etymology. As we have pointed out, this is why Structured Word Inquiry (SWI) is not about “adding” morphological instruction to phonics instruction — its about teaching how the system works. This is why I argue that SWI teaches grapheme-phoneme correspondences more explicitly and accurately than phonics. Phonics instruction (under the definition of associations of pronunciations and letters without reference to morphology or etymology) cannot explain the grapheme-phoneme correspondences in countless words like does or rough or every or homophones, and so on. So many people miss the absolute detail into orthographic phonology that comes with SWI. “It’s as simple as starting with the “known” and then expanding from that. Even if kids know all the words in a morphological family (e.g. play, playing, playful, replay, playhouse) the lesson is not about new vocabulary, but learning how word structure links words. That concept can then be applied anywhere. “The other thing I keep in mind when choosing morphological families to investigate is the orthographic concepts a family has to offer. If I’ve established the fact that words that share a base share a spelling and a meaning connection, then I can introduce a base like with words like actor, acting, react, and action as a way to introduce the fact that the pronunciation of morpheme might change but keep the spelling. In that way we learn the phonology of t is not the “t sound”, but that the grapheme can write /t/ when that is the appropriate sound. I’ve attached an example of a lesson I’ve used for that before. “I also draw on the <-ed> suffix from early on to highlight this same concept that morphemes do not have pronunciations until they are in a word. The pronunciation of a word like is another useful one to get rid of this idea of a “t sound” since this very common pronunciation of a very common suffix is what is typically thought of the “t sound,” but their ain’t no /t/! “And then you also encounter words that give rise to the need to teach all the suffixing changes. I don’t disagree with Peter on any of this, except I’m not as dismissive of the kind of list that you are requesting. I don’t see it as mutually exclusive from the curriculum goals that he specified or contradictory of the kind of instruction he described. Many teachers, when referring to morphology or “structural analysis”, actually are talking about affixes alone, and not the bases. If that is the case here, there are some lists like that which present the most common prefixes and suffixes from textbooks in grades 3-9 (White, Sowell, & Yanagihara, 1989). You can easily find those lists on line and you could definitely make use of those lists to make sure that you are hitting all the notes if you do the word sums and matrixes that Peter recommends. Otherwise, I haven’t been able to come up with a graded list of bases for you to use. But I have passed your letter along to my friends at MetaMetrics (the Lexile people) and have asked if they could produce such a list from their language corpus of more than 1 billion words. Stay tuned! Tim, would you be surprised if research started to show morphology as a more effective early reading instruction than phonics? Or, to say it another way, do you think there is a fatal flaw to the morphology over phonics as early reading instruction? Or to the idea that early instruction should be phonemic awareness/phonics/morphology? Thank you so much, Peter, for writing this and, Tim, for posting it. Ever since our initial lengthy discussion about morphology a year ago, I have become a better teacher by paying attention to and incorporating morphology instruction at all "teachability" moments in addition to planned instruction. "Phonics instruction (under the definition of associations of pronunciations and letters without reference to morphology or etymology) cannot explain the grapheme-phoneme correspondences in countless words like does or rough or every or homophones, and so on. So many people miss the absolute detail into orthographic phonology that comes with SWI." I just don't see the necessity of making these explanations to beginning readers, and after watching the kindergarten video posted--and previously the pre-school video on "rain"--I'm curious to see any examples of teaching non-readers how to blend and segment sounds in reading and writing (/e/ /gg/, /ch/ /i/ /ck/, /w/ /ai/ /t/, /w/ /a/ /tch/, etc.) with this stated emphasis on morphology. If there are links to teaching non-readers how to blend and segment that de-emphasizes phonics (grapheme-phoneme connections), I would love to see them. Once again, I don't want to re-open the debate. I'm just wondering what this beginning insruction actually looks like so I can see how it differs from my own. Once again, I am so grateful that you have included this piece on morphology, and I will definitely continue to emphasize morphological instruction. Many thanks to Tim for sharing this correspondence. I really appreciate the sharing of ideas whether we are always on the same page or not. Hello to Robert and Harriett and thank you both for your comments. I suspect I will have more to say later, but before the comment strings grow, I want to make a key point as clearly as possible regarding what you have both written. Harriett raises the idea of a "morphology vs. phonics debate". Robert asks about what the research might say about "morphology as a more effective early reading instruction than phonics." I want it to be clear to all readers that I have never made any argument in the research or in any other context in which I am talking about "morphology vs. phonics." My meta-analysis on morphological instruction (Bowers, Kirby & Deacon, 2010) looked at the effect of INCLUDING morphological content in literacy instruction across the grades and with able and less able students. That is NOT about comparing morphology instruction to phonics instruction. Instruction that could be characterized as structured word inquiry (Kirby & Bowers, 2010) grows from the basic premise that instruction should accurately reflect the nature of the domain being taught. In the context of literacy, that means literacy instruction should accurately reflect how the writing system works. Our writing system is a complex system that reflects the interrelation morphology, etymology and phonology. I have NEVER promoted "morphological instruction" in contrast to "phonics instruction" or the other way around.. It turns out that understanding orthographic phonology in English means understanding the conventions that govern grapheme-phoneme correspondences. Not only does this mean learning what graphemes are available to write which phonemes -- it also means learning how the choice of grapheme is constrained by morphological and etymological considerations. I reject both sides of this proposed "morphology vs. phonics" debate, because neither can represent how our writing system works. In every piece of writing I've done on the subject in research, in comments on this blog and in my own practice I have always emphasized the idea that instruction of the written word should reflects the interrelation of morphology, etymology and phonology. Those arguments should never be interpreted as even being relevant to any debate about "morphology vs phonics instruction". I'm not participating in that debate. Harriett, with reference to my recommendations for bringing attention to morphological and etymological constraints on grapheme-phoneme correspondences in early literacy instruction, you write, "I just don't see the necessity of making these explanations to beginning readers". I can argue, "I just don't see the necessity of AVOIDING the understanding of grapheme-phoneme correspondences that can be brought by teaching the meaning-structure clues inherent in our language." I understand why my writing about this can be hard to understand. It is so much easier for me to see what this instruction looks like and how children respond to it. In my work, I regularly see the clarity of understanding for grapheme-phoneme correspondences children gain who have struggled for so long in the context of isolated phonics instruction. Children who misspell the word "does" as *"dose" or *"duz" are excited to UNDERSTAND that this spelling is built on the base "do" and the suffix "-es". They are being given an understanding, not being told to memorize another irregular word. They are relieved to understand that their misspelling *"acshun" can't make sense because that doesn't have the spelling of the meaningfully related base "act". They can understand that the "t" grapheme of "action" links it to the spelling of the base "act". Suddenly something that seemed random and weird makes sense. And now they have the beginning of an understanding not only of these specific spellings, but principles that drive the entire spelling system. What could motivate a young child learning to read and write, or a student who has long struggled more than gaining the sense that this writing system they are trying to study actually is actually UNDERSTANDABLE? My own view is that anyone who is committed to instruction that helps children learn the "letter-sound correspondences" as effectively as possible should love structured word inquiry. It provides explicit instruction not only into grapheme-phoneme correspondences in words, but how to understand how and why they work for that word and its relatives in a meaningful context. This view finds support in the evidence from meta-analyses and reviews about the effects of INCLUDING morphological instruction (again not morphology vs. phonics). That research showed that the greatest benefits were found for less able and younger readers. This finding is in direct opposition to what would be predicted by what can be described as the "phonics first hypothesis". The findings from these meta-analyses and reviews support the hypothesis that we should include morphology from the start and that this is also particularly important for the less able. I have seen zero research showing any benefit of AVOIDING morphological instruction with young readers or anyone else. In terms of the research I would add that the two meta-analyses of including morphological instruction by Goodwin & Awn (2010, 2013) the outcome that had the greatest effect sizes from studies which included morphological instruction was phonological awareness (d = .49 and d=.48 respectively). In both studies (the first for students with literacy difficulties, the second with all students) the effect on morphological knowledge (d= 40 and d.44 respectively) was second after phonological awareness. I don't understand how these research findings are reconciled with the argument that morphology instruction should be avoided until after isolated phonics instruction. I know you were trying to avoid re-opening the "debate" but your post and Roberts highlight that we seem not to be having the same debate. I'm hoping this adds some clarity to what I have been trying to put forward. Thanks, Pete. I don't think this reopens the debate because these points have been so extensively articulated already (including your rebuttal to Ending the Reading Wars) that I really do feel we must await better research regarding how morphology fits in to approaching students who have no phonemic awareness and no letter-sound knowledge--i.e., beginning readers. Once these students gain the ability to "crack the code" with monosyllabic words, then everything you say about adding the morphological piece makes perfect sense to me. If you have any videos of what teaching non-readers to blend and segment on their own looks like with the methods you advocate, I would love to see these. The videos I've seen either involve students who can already decode mono-syllabic words or who are being taught morphemes--in, for example, eggs, watched, raining--rather than how to decode the words egg, watch, rain, etc. in the first place. Thanks for taking out so much time. As I keep saying, I've learned a lot, and your overall recommendations have made me a better teacher. Although our list does not start Latin-Greek prefixes until grade 2, we have worked with schools in Akron that have doing these in Grade 1. I think Pete makes a great point that we should also be looking for opportunities to teach children morphological patterns from the actual books and other reading texts they encounter naturally. Thanks for chiming in Timothy, and for sharing this list to consider. Do you see a problem with starting with the idea of "word families" that are based on sound, and then using that same term "families" for words based on morphological relations? At first children are being taught to think of "word families" as being words based on common pronunciations of common letter sequences. So to just pick two examples from your "sound families" page, you target the final "ed" with the example word "red". But that pronunciation is never the pronunciation of the "ed" sequence when that spelling is for the suffix "-ed". Also this instruction would suggest a student should write the word "said" as *"sed" etc. This just one reason the word sum is a necessary tool for morphological understanding. It is able to falsify hypotheses. With a start like that, we can look for words with this final letter sequence and try to see when that "ed" is a suffix and when it is in the base -- and how that informs the grapheme-phoneme correspondences that we find. Instead of picking words that have the letter-sound correspondence we are intending to teach, and not picking the ones that have that letter sequence and a different pronunciation, why not let kids find words with final "ed" and then explore the pronunciation and structures of those words? Here is a page like ones use all the time in lessons from Kinder to upper elementary. The bases in this page were taken from a book the class was reading and we made sure kids knew all these words. Also, depending on the class and the student, there is no need for this to be an activity kids can do without support. But whenever I do this activity kids are paying incredibly close attention to what the "feel" at the end of saying these words and they can feel the difference between the pronunciations of the "-ed" suffix and a final "ed" when it is in a base. To pick one other example, you have "ow" and the word "cow". How about finding a page of text with words like "cow" and "row" so kids can identify this digraph, and see that it can do two jobs? Now they can go on treasure hunts for words with "ow" digraphs and categorize them according to what pronunciation they link to. This brings that inquiry part to structured word inquiry. I find that once kids identify a specific grapheme, they are always looking for other things that grapheme can do. One principle of understanding something is understanding what it is not -- just like the Sesame Street game "which one doesn't belong". When you pick words where a grapheme has the same pronunciation even though that grapheme also represents other pronunciation. With that background, we foster the understanding that most graphemes can represent more than one phoneme, and this is a good thing! We don't write "jumped" as *"jumpt" just because the word is pronounced with a final /t/ phoneme. We need to use the "-ed" suffix because it is marking the past tense of "jump" no matter how it is pronounced. In terms of the morphological families part of your document, there are other issues to consider. One is that it is likely to be used as a list of what are called common prefixes suffixes and bases as opposed picking a word, analyzing its base and then seeing what other words it is related to with word sums and a matrix. When morphological families are studied that way, we learn about the suffixing changes, and how graphemes used in the spelling of a morpheme need to represent any of the pronunciations of that morpheme. (With the "-ed" suffix, we see that the "d" grapheme can write the /t/ phoneme!). The other problem is that WITHOUT analysis with word sums, morpheme lists invariably have many morphemic errors. You have "fin" and "finit" listed as bases for "end, limit" term" and the words "final" and "infinite" listed. It turns out there is no base "fin" or "finit". The words you have identified, however, can be analyzed to show they derive from the free base "fine". If you look up the etymology of either of these words on an etymological reference like www.etymonline.com, you'll find they grow from a Latin root 'fin(ere)' with the original sense "limit, end, boundary, conclusion". If you search that root, you can find other related words like "define" "refine" "finish" and "finality"
That allows us to discuss that when we "refine something" we "finish" it. When we "define" something, we are putting boundaries around what it does and does not mean. If something is "infinite" it has no end. Studying these morphologically related terms AT THE SAME TIME deepens the understanding of all this vocabulary because understanding of the underlying meaning of the base is established and discussed in relation to the meaning of all of these words. Notice, again how much the pronunciation of this base shifts, and that the final "e" is replaced by vowel suffixes. All of this is ensuring that our instruction reflects the interrelation of morphology, etymology and phonology. At this link you can see a page I created for a Gr. 5 class that asked me to do an SWI lesson for their math class that was struggling with helping the kids define the concept of "infinity". If you look at that document, you'll see how lovely this idea is -- and why "infinity" is such a fascinatingly hard one to really define! I've only pointed to one example where what you have listed as a morpheme is actually not the spelling of that morpheme. I'm not picking on your resource. The reason these confusions are so common is that the only safe way to identify a written morpheme is to analyze it with word sums, to look for morphological relatives and test that with the etymology. The final point I would add is that the process of practicing analyzing words morphologically is a way to deepen the learning experience for students AND teachers. Once you've succeeded in proving a base like "fine" is related to "infinite" "finish" "final" and "define" and you've understood the spelling-meaning connections, we remember not only those morphemes, and the process of proving them, we get better at encountering other words that have not been presented i a list, but have just been given to us. For example, if you think about the word "disease" and you spell-it out loud and try to construct a word sum, I think you might find a new depth of understanding of what a "disease" is. It's those lightbulb moments of new understanding that motivates on-going investigations. I have only skimmed this discussion but would like to point out that the meaning of the Latin base plac is NOT "to fold" but, rather "to please, to calm:" it generates such "calming" words as placate, placid, placebo, implacable, complacent (pleased with oneself). No "folding" words are derived from the base plac. English DISPLAY, as correctly explained in an earlier comment, IS built on the Latin "unfold"- displicare but its spelling with "a" is irregular, having undergone changes through French and Middle English. This discussion demonstrates the fascinating appeal that roots hold for learners of English vocabulary. A veritable host of folding words are generated by the Latin base plic, plicit, ply, plex (these are the 4 most commonly encountered forms): plywood, imply, implicit, implicate, explicit, complicate, complex, complexion (the "folding" "together" of skin tones), comply (go "with" the "fold"! ), reply, replica, replicate, perplex, duplex,duplicate, apply, applicant, duplicity (double folded treachery! ), and even multiple (= maniFOLD) and triple ("threeFOLD"). As a classicist who has taught Greek, Latin, and classical etymology for over 30 years, I respectfully issue a caveat to my fellow language lovers: many roots lists available online and even in printed books are too full of errors to be reliable. If you want a reliable list of Greek and Latin prefixes, bases, and suffixes, see T. Rasinski-N. Padak-R. Newton -E. Newton (I am Rick Newton, by the way...), "Greek and Latin Roots: Keys to Building Vocabulary: Appendix C is a 15-page list of roots found in academic vocabulary: each root is accompanied by a few sample words that can "prime the pump" of gushing derivatives. Thank you for finding this error. Actually is was a typo. I was trying to write the Latin suffix cited in Etymonline, plic(are) for "to fold"
I'll ask Tim to correct that in the post so that I don't confuse anyone else! The root I typed by mistake was the one you mention, the Latin plac(ere) that Etymonline cites as having had the meaning "to be acceptable, be liked, be approved,"
That just happens to be a favourite root. If you search "placere" in Etymonline, you will find a fascinating pile of words that are related to that sense and meaning. Some of those words have the base , but there are many others. Words like "placate" and "placid" are there to be found. Even "placebo" seem to be related! So glad you didn't let that error of mine go! BTW, there are a number of formatting problems in the post that I know Tim will be fixing up. Sometimes words are missing because of issues with symbols like angle brackets etc in this software. I appreciate the thoughtful commentary on this subject. Any type of listing of morphemes for instruction is not without its shortcomings. The list I offered in my previous posting was meant as a starting place for how teachers might think about bringing morphological study into their classrooms. As humans we have a propensity to see patterns in linguistic (and other) environments. That is why the teaching of rimes as an approach to phonics is so valuable - knowing one rime can help children figure out the pronunciation of many words. The logic in the list we developed was that we can take the children’s developing sense of letter patterns found in phonics (rimes) and begin to have them apply that same approach to morphemes – knowing one morphemic pattern can help students learn the meaning to many English words (e.g. trac/tract meaning drag, pull or draw, can help students unlock the meaning and pronunciation to words such as -- extract, distract, contraction, retractable, traction, tractor, etc.) . Certainly there are challenges and exceptions to this approach, but our experience has been quite positive. Teachers knowledgeable in rimes and morphemes seem quite able to help children negotiate these challenges. The big idea for us is that since English words are made up of patterns, let’s help kids see these patterns in words – not only sound patterns (rimes), but also meaning patterns (morphemes). Yes, placebo is indeed from Latin plac. In fact, placebo is an intact Latin word. It is the future tense, first person singular, of the verb placere. It means, "I will please/calm/assuage this patient ... by prescribing a sugar pill since there is no malady to be cured." The patient would then take this hand-scribbled prescription to the pharmacist, who knew the "code" and gave the patient sugar pills to make him/her happy. Placebos were originally given to hypochondriacs to keep them from returning to the doctor for no reason. Since only doctors and pharmacists knew Latin, the code was a kind of in-house language (the technical term is " cryptolalic"! )I also suspect that the tradition of doctors having illegible handwriting was intentional, designed to deter the prying eyes of patients, just in case an occasional patient might have studied Latin! I suggest this because the first "organised" doctors of ancient Greece were members of a secret honorary society schooled in the mysteries of Hippocrates (himself a devotee of Asclepius, son of Apollo, the healing sun god). The Hippocratic oath was sworn to by all initiates into the private"club." So, cryptolalic Latin among medical professionals today would be in line with this ancient tradition. Etymologies can be a world of fun, especially if you are a Latin lover!! If we can share stories like this with students, we can show them that language study is intrinsically interesting and engaging. They are likely to retain more vocabulary and even to delve into the history of words as they make connections. Robert— I wouldn’t be surprised if morphology did well in some kind of comparison study... unless you’re talking about beginning reading. I see how morphological info could be very helpful once the reading process has gotten underway phonologically (which is what studies have shown so far), but how you’d start with morphology escapes me. "Further support for the decision to teach grapheme-phoneme correspondences rather than onsets and rime correspondences comes from analyses of the relative numbers of each type of correspondence required for children to be able to read the words they typically encounter in their reading materials, as we reported in Chapter 4: children need to know almost five times as many onset and rime correspondences as grapheme-phoneme correspondences to read all monosyllabic words in the early version of the Children's Printed Word Database (Stuart, Dixon, Masterson & Gray, 2003). It is simply more efficient to teach children grapheme-phoneme correspondences." My experiences confirm this recommendation, especially with regard to struggling students. My comments about the use of onsets and rimes for phonics does not preclude teaching grapheme-phoneme correspondences. It's not a one or the other proposition. We need to use all the tools at our disposal. I do know that when I come to a word that I am not familiar with I look for letter patterns (rimes or morphemes) that I know to help me decode the word. I'd like to make an observation about the discussion that has followed Tim's post. The topic of the post was sparked by a question about ways of teaching morphology. Is there a recommended scope and sequence of morphemes to teach? My response (which people are free to challenge!) argued that I would not recommend such a list. Instead I argued that the starting point for me is not "what morphemes to teach" but instead the importance of teaching the relationship between morphology and phonology so that instruction reflects the fact that a written morpheme can have multiple pronunciations. To understand how English spelling works, we need to move away from letting lists of grapheme-phoneme correspondences to teach or which morphemes to teach, and move to teaching how the whole integrated system works. That means instruction should build understanding of how morphological structure constrains grapheme-phoneme correspondences. I also pointed out that while many are concerned about morphological instruction taking time away from learning grapheme-phoneme correspondences, it turns out teaching this interrelation is the only way children can understand many grapheme-phoneme correspondences. As just one example, a child cannot UNDERSTAND why the word "jumped" is spelled as it is instead of the misspelling *"jumpt" without reference to the pronunciations of the morpheme "-ed". However, when you look at the discussion that follows, do you see how often the topic of morphology disappears? The questions that start avoid the key point of teaching the interrelation of morphology and phonology and move to a "phonics vs. morphology" debate and whether to start with isolated phonology (phonics) and now the discussion is asking about teaching graphemes and/or onsets and rimes. These are legitimate topics of discussion -- but they do not respond to the key arguments being presented. It seems to me that the comment string here is a good reflection about the way I see instructional research and teaching practice deal with morphology. It gets side-lined and thought of as something you might do "in addition" to phonologically based instruction. What I want to highlight again is that what I'm suggesting is not that we "teach morphology" as an isolated thing in the way that phonics teaches about phonological aspects of spelling in isolation of morphology and etymology. The question that was sent to me was about which morphemes to teach when. I propose that this is not the best question, but instead that instead of teaching isolated morphemes, we should look at instruction which builds on morphological families of words that kids encounter at whatever age they are. The matrix and word sum are perfect scientific tools for that job. I hope readers saw how helpful those tools were for refining instruction of morphemes that was suggested in this string. Only with morphological analysis with word sums can we be confident that the morphemes we teach are actually valid written morphemes! And when teachers use the matrix and word sums to frame instruction around morphological families, they do not need a pre-selected list of morphemes. They will encounter the most frequent morphemes when instruction is framed around morphological families because the most frequent morphemes are highly frequent! You don't need to make a list to make sure you teach them. Also by building instruction around matrices and words sums, teachers and students will necessarily encounter the interrelation of morphology and phonology and the suffixing changes. When we teach with the matrix and word sum, we cannot avoid the interrelation of morphology, etymology and phonology as is so often missed in the wider research conversation and the comment string on this post. Given all of that, I would be very interested in further comments, questions, concerns about that proposal and let the questions about phonics (isolated phonologically based instruction) to other conversations. I am still processing all of this. I have several comments but here is part 1. Look up "listless." It sparks thought about why a list can be useful. It's motivating and provides discipline, strategy, and, yes, a helpline. Teachers seem to find this helpful in their overwhelming days. If you want list evidence, "The Checklist Manifesto" is a place to start. I agree with what Pete is saying but a list provides entre, a way in. When I run by the grocery store at the end of the day, frazzled, what do you think a list does for me? It's a "way in" to ending up with dinner. So I think an integrated list can be a "way in" to learning Pete's excellent practices. When learning something new, it's hard to integrate well on the fly. List just gives a structure, a fall back, a plan. Our focus is early (kindergarten) learning. We are focused on language development as well as spelling/reading. We use our list for all of those, as a point of departure. Yes, morphology is a binding agent. We resequenced the Fry list so it reflected "that memory is best when the to-be-learned info is organized in a meaningful and logical manner and when the learning context is characterized by generating and testing hypotheses." (Bowers & Bowers). Example: our #15 is "end." I'm now incorporating Pete's work there. Lots of word sum and matrix pieces work for "end" and this is only word # 15. We can't wait until multi syllable words for rich, meaningful word work. Instead of "get through early words so you can get to interesting, multi syllable words," we need to make first words meaningful= phonemics and morphology. One syllable words can be very interesting when you use morphology as the binding agent, orally and/or written. Plus, of course, teaching these beginners how the phoneme-grapheme code works as well. This is one example of combining morphology and phonology for early words. We have many examples that are fairly simple and early but it was hard to figure out this explicit (of phonology and morphology) integration. But, again, we resequenced the Fry list because teachers weren't ready to leave the high-frequency idea nor was the district. I do think the relationship between morphology and phonology can be explicitly integrated resulting in a much better outcome for students. "No one approach best for all children"
This is an issue that comes up all the time. My response, however, is a bit complicated (as usual). One point is to be clear on what is meant by "approach". The absolute foundational premise of structured word inquiry is not what I think can be called an "instructional approach". That premise is that instruction of the written word should accurately reflect the conventions of English orthography (or the orthography of whatever language is being taught). The "approach" part of structured word inquiry is the recommendation to use the principles and process of scientific inquiry to guide the instruction of that system. My point is there may not be one instructional "approach" that works best for all children, but obviously every literacy learner in English is working with the exact same orthographic system. One could design instruction that reflected completely valid orthographic facts and choose to use a mainly "rote memory approach" to study orthographic conventions, or one could use the approach I obviously prefer -- guided scientific inquiry of those orthographic conventions in the context of words and texts the children are interested in. Those are questions about approach. The issue I have with phonics is that it misrepresents not only the orthography system in general, but also that it misrepresents the part of the orthography system that is it argues is so important -- the associations between the pronunciations of words and how those units of speech are spelled (grapheme-phoneme correspondences). See my discussion about the INTERRELATION of morphology, etymology and phonology, and the fact that grapheme-phoneme correspondences are constrained by morphological and etymological factors in Tim's post. Perhaps the easiest description of the problem is that when you teach grapheme-phoneme correspondences without reference to morphology and etymology, you necessarily end up with long lists of spellings that do not match the grapheme-phoneme correspondences that we teach. Thus every phonics program I know has lists of irregular words that children are taught they have to memorize because they do not make sense. Once we are faced with lists of high frequency words that are "irregular" the possibility for the "scientific inquiry approach" is lost. One cannot inquire scientifically into an irregular system. Viewed through a scientific lens, words that are called "exception words" in phonics, should be seen as falsification of the phonics rules being taught. What I'm trying to convey is that any question about teaching phonics vs. structured word inquiry and whether one is better for some kids or others is properly framed as -- Should instruction build an accurate understanding of the ordered way English spelling works, or should we misrepresent it as a sound-based system that has many exceptions? One thing that makes it so hard for many to make sense of of structured word inquiry is that it is not understandable until one actually spends time working with analyzing families of words with word sums and matrices. I don't use the word "phonics" within structured word inquiry because phonics is about teaching commonly associated letter-sound correspondences WITHOUT reference to morphology and phonology. What I do teach extremely explicitly from the beginning in structured word inquiry is properly termed "orthographic phonology". This phrase reflects the fact that structured word inquiry teaches the conventions which govern grapheme-phoneme correspondences. This is why I claim that all the benefits that one gets from phonics instruction are gained through structured word inquiry -- both forms of instruction explicitly teach grapheme-phoneme correspondences. But, by teaching those correspondences within the context of meaningful morphological and etymological constraints, structured word inquiry, offers an UNDERSTANDING of those grapheme-phoneme correspondences that is not possible in phonics. Further, because phonics fails to reference morphological structure, it ends up misrepresenting countless grapheme-phoneme correspondences. For example, many phonics based programs will teach about the "z sound" even though the most common grapheme to write that phoneme is the "s". Similarly, many more sophisticated phonics based programs that I see teach about a *"ti" digraph -- but there is no such grapheme anywhere. The word "action" does not have a "ti" digraph for the "sh sound". That is demonstrated by the word sum "act + ion ? action". Such a word sum allows us to discover that the "t" grapheme can write the phoneme that phonics often teaches as the "sh sound". So, far from underemphasizing the phonological role in spelling, structured word inquiry addresses orthographic phonology more precisely than can phonics. I understand your teacher's point about the typical argument not being about "phonics vs. no phonics" but being about "my phonics vs. your phonics". In fact I think that is often a reasonable description of debates that go on. I hope that I have clarified, however, that this does not represent the discussion with regard to structured word inquiry. As my comments in Tim's post emphasized -- structured word inquiry is not about "adding" morphology and etymology to phonics instruction. It's about teaching how our writing system works -- and therefore it teaches the interrelation of phonology with morphology and etymology as it operates in English orthography. The closest you could get to is to say there is a debate between teaching phonics and orthographic phonology. Thanks so much for your thoughtful comments. I love your first sentence, "I am still processing all of this." Perfect! Just as you would need to. I always argue that there is NO HURRY to understand structured word inquiry, the only hurry is to START trying to understand how English orthography actually works. I also understand the frame you make about a list of morphemes as a "way in". Perhaps, but I fear it just starts the whole process in the wrong direction. I would be less concerned with highlighting a number of "word families" that are particularly rich for getting started because of the orthographic concepts they teach. I end up drawing on investigations of the families of the following words all the time in early literacy instruction: help, play, act, friend, sign, know, sight, please, heal, hop, hope, try, busy (and many more). - graphemes can be single letter graphemes, digraphs and trigraphs that write a single phoneme. That is just a partial list of the concepts that can be investigated from this selection of bases. But the point is not these based -- the point is the concepts they can teach. So in this way, I'm with you. I don't mind sharing this "list" of bases that I've found to be very productive, but the way I'm doing it, I'm explicitly articulating the orthographic concepts that are the target. My hope is that teachers would learn about these concepts themselves by investigating such a list with word webs, word sums and matrices and related grapheme-phoneme charts. Further, my real hope is that teachers would treat such a list as a jumping off point to draw on words from any book or topic that could teach these same concepts. But this is not a list of morphemes, and I introduce it not because of the words themselves, but as possible words to teach key concepts. I'm OK with sharing such a list with such an understanding as a way into understanding orthography and how it can be taught through structured word inquiry (SWI). It shows the use of the base "play" as a great jumping off point for very young children as they build a word web from words that share that base. The first video at this page (https://blogs.zis.ch/dallen/2014/09/24/thank-you-pete-bowers/) shows me teaching a lesson to Grade 1 students about the homophone principle and function vs. content words that gets at many rich orthographic concepts too. Thanks for your great observations Tory. Thanks, Pete. Here is my part 2. I do know that my "play on words" with listless ignored the common meaning (it doesn't mean without a list!). That is what makes the whole thing interesting as we work to sensitize children to levels of language. One point I am trying to make, in prior blog posts on LN as well, is about sequence. There is little to no evidence on optimum sequencing. Rationales, yes. Conventions, yes. But the various kinds of evidence Pete writes about and demonstrates, as well as Seidenberg's book, suggests we look very closely at ,say, this hyper first focus on CVC words. My working theory is that the very reason the heavy emphasis on phonemics/phonics isn't getting the job done is because it fails the "binding agent test" with sub lexical and lexical meaning. For beginning readers, I think we all agree that sound-symbol is in there for sure. A difference between Pete's focus and mine is orthography vs. oral language development. My kids are not LD but need language work, ways to enrich due to lack of language/print exposure. So if we teach the spelling (including letter formation/handwriting) and reading of end, we go oral with what Pete typically demonstrates in written format. Teachers could use word sums, matrices to support oral language development anchored in a written element. END is good because look how many ENDings and beginnings you can play with. What should we call it? "Awareness" is certainly heavily used but we are bolding language awareness--how language combines and deconstructs--from sub lexical to behind phrase level. Example: UP, our #33 in kindergarten. It's robust in terms of phonemics and phonics--not difficult to perceive. So we go big on Usage; thumb's up, what's up, sun up [dawn], close up, not up on that...we listed about 30 of these not as a SEQUENCE but because it's hard to come up with things on the fly when you are focused on the kids. Then we listed same # of Links where UP connects to beat, date, chuck, ward, shot, stairs, coming, and also upper, uppercase, etc. And of course up can be in second position: wake up, give up, etc. Our list goes from UP to CUP, CUPS. So the kids learn just like in Pete's great example about rED, vs. jumpED, etc. We have done a great many things to enrich first word learning. I loved Pete's work but, as you can see, I am very focused on how to incorporate in into beginning reading and language development. I think we can use the concrete graphics Pete has designed, selectively. I also am trying to apply Pete's design principles to Structured Letter Inquiry (SLI). Because, again, as much as everyone wants to get to the almighty word, our kids need some interesting inquiry into how these funny combos of lines and curves become symbols. I don't have it all figured out but I think Pete's work can connect in a much bigger way to beginning reading. Again, I am processing, including the notion of order, define it as you will: sequence, a list, being "systematic." It is the same principle I think. 100% believe that we must use design principles that show the logic of the written system. Which children need what degree of structure to transfer and apply various principles related to language? Which aspect of the logic should our "order" spring from at what point in time? (We went round about this same principle in the Letter Name posts.) The evidence that Pete cites regarding larger effect sizes for preschool and early education as well as findings that morphological instruction is more beneficial for less able students is consistent with my experience. This is truly exciting for how we might reimagine and design some of our early reading practices. As I wrote earlier, oral morphology is going to be a piece of this equation. In our design, we also use Pete's example of do/does/doing. But include done. I suppose this is another point about how words form/relate. And same for /go/goes/going/gone. A math teacher pointed out how many of our "First 50 Partial Decodables" are important for math. So we made a category: "how much or many words." Does this add a meaning layer then--more order---to these partially decodable words? SOME>BOTH>MORE>MOST>ANY>MANY>NONE...and then we list these partially-decodable number words because teachers really want kids to know them: ONE>TWO (which keys off the decodable TWIN and the concept of "twoness" taught in our decodable list) >FOUR. Our decodable list contains three, five, six, seven, nine, ten but they are within a phonics sequence based on vowel sound. "Eight" is just a big blow-out celebration that is a later reward and surprise once we cover these more basic graphemes. Yes, kids ask and it's a big build up to "wait and see!" "You will be amazed how it works!" This can all be better thanks to these posts. Thank you for responding to my question. I have often talked with my colleagues about how we should conduct meaningful morphology instruction in the classroom. The links that were provided by Mr. Bowers were very insightful, and it really gave us a lot to discuss throughout the past week. However, you are correct. I am interested in a list of bases, especially for the upper elementary and middle school students. I think this will be beneficial for educators to have a foundational list of bases to continue their morpheme units each year. I also want to say thank you to everyone who provided their insight into this topic. Your expertise are greatly appreciated. We are looking over all of your comments and using them to fashion a stronger morphological study for our students this year. How wonderful to hear from such experts in the field of literacy on this topic. I recently completed my dissertation where I analyzed the multiple morpheme words within the K-1 Exemplar Texts from the Common Core State Standards (both student read and teacher read aloud). Dr. Bill Nagy was the chair of my committee. It seems that there is a push to teach derivational morphology at early ages. The CCSS lists derivational morphology goals starting in kindergarten (with a handful of common prefixes and suffixes given as examples to teach). There were zero instances of words containing these prefixes and suffixes however in the set of K-1 student read texts. Still, I could see ways for kindergarten teachers to build up student knowledge of common prefixes and suffixes moving from spoken language to written language. The teacher read aloud exemplar texts did provide examples, so can be emphasized during instruction, too. The term "multi-linguistic word study" is becoming more commonly used in reading disability research, with all of the linguistic elements of words needing to be taught in a coherent/complementary manner (including phonemic awareness, decoding skills, morphological awareness, orthographic awareness/spelling, semantics...). I would like to learn from you experts how this type of word study can be developed and described to educators, most effectively. At this time, word work seems to be disjointed. For example, at my elementary school there is debate about "do we teach spelling?" Morphology seems to be something that is gaining a bit of interest (at least in part due to me). Bits and pieces of various word work programs are being looked at, but not with any real coherence. For example, encoding and decoding instruction should be taught together, according to Dr. Anita Archer. Dr. MaryAnne Wolf has created an intervention called RAVE-O which incorporates all of the linguistic features of words, giving students redundant links to get to words. Dr. Kenn Apel has done considerable research and developed multi-linguistic word study interventions. I would love to be able to put together an inservice for staff to describe the big picture and best practice for how all of the linguistic elements of words will be instructed and targeted over the elementary school years in a coherent manner. Sorry I was unclear re: the "list" discussion. Like Pete, I don't favor a "list" of disembodied morphological units but instead doing a lot early with meaning--across unit levels: sub lexical, lexical and supra lexical--with early words. This patterns the difference between words that can grow (like "end" or "fast") vs. those that need other words (or context) to add meaning ( e.g. function words like "and"; certain verbs, etc.) As you reference, there is always the complexity of oral vs. written decisions. "Upper" is a good oral example since "uppercase" is important but we extend beyond that example orally. "Name" is another early word. Choosing to explicate "named" or "unnamed" or "nameless" is rich language building. It's useful to include idea of prefix, not just suffix. The point is that we can do a lot more with early words than rote teaching. We use Pete's word groupings like do/does/doing, but include done. Language is always teaching us to be flexible="done" may not be morphologically as balanced but the meaning connects and the orthographic pattern link is useful and reinforced with go/goes/going/gone. I've made points already about "sequence" and believe there is a long way to go on this issue. We tend to anchor a first element such as "do" in the case above. Then teach the related words a bit later. But I am already rethinking this with what I've learned from Tim and Pete. The children tend to surprise you if teaching is explicit to show the "system" but also rich and interesting which reflects statistical learning. The meaning/orthography connections related to the pronunciation shifts are part of that statistical learning and do/doing/does/done may be a good early example to show this. Ditto for said/say/says/saying. Otherwise children approach each of these words as a completely new, difficult word to read and spell and may never make these connections. Timing is key and I am confident, again, that sequence matters. Early application of Pete's "binding agent" is what I'm thinking about here. We don't want to obscure the levels of the system but to show them. But, as I also said earlier, lists can provide way finding for teachers. So in that sense a list of affixes for use with early word teaching can be a useful.